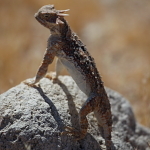 Also, look for the herps seen on this trip in my EOY 2014 post on the main forum. 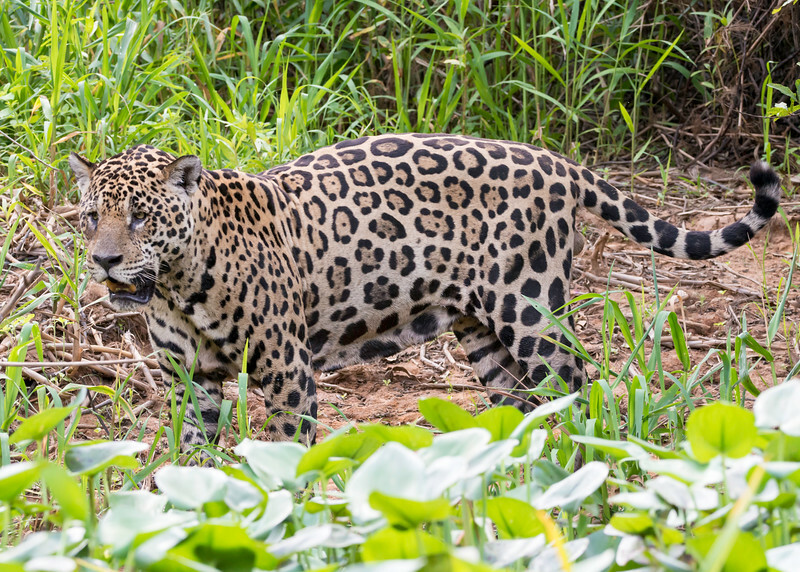 While many tourists are birders, most come to the Pantanal because it is the one place where a person has an almost certain chance of seeing Jaguars (and a lot more) in the wild. 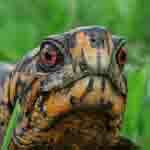 We stayed at four different lodges along the Transpantanal highway, staying from one to four nights at each one. 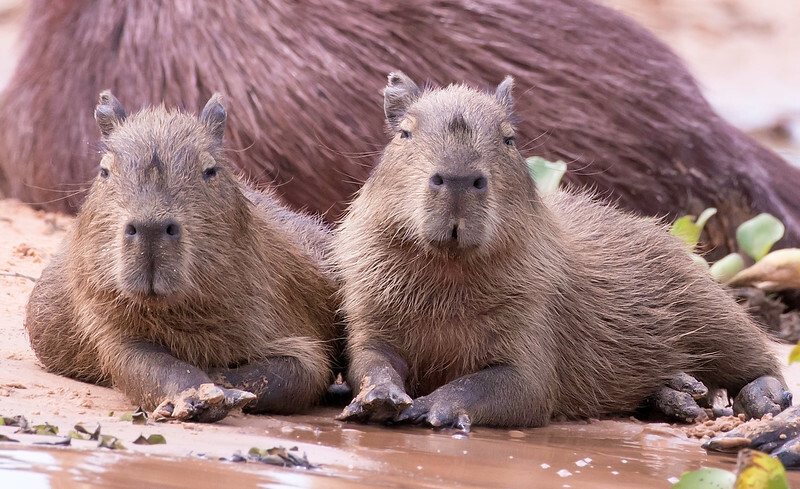 At the first lodge, ponds lined the miles-long driveway and Capybaras were abundant. Here a Southern Caracara picks ticks off of one. She seemed to like it, and rolled over to expose her belly. Here a Wattled Jacana uses a Capybara as a perch to look for insects. 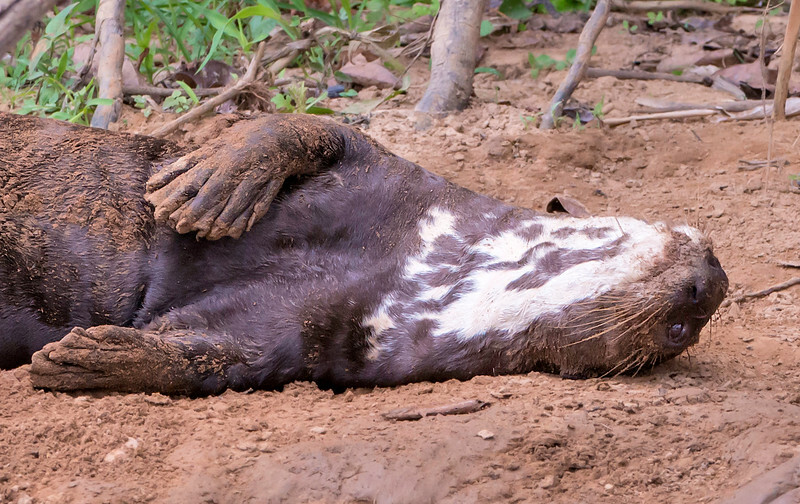 The first evening we drove to a pond where a pair of Tapirs is known to occasionally emerge from the forest at dusk for a soak. 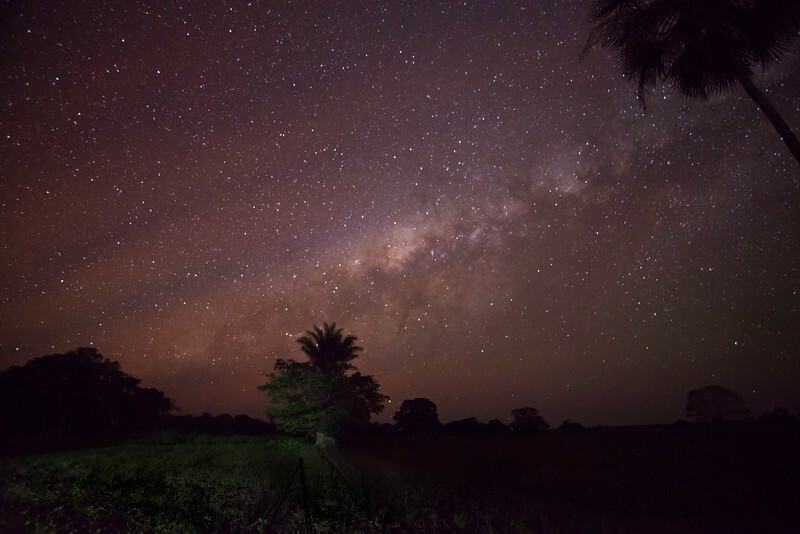 We were lucky and they obliged us with an appearance that night. 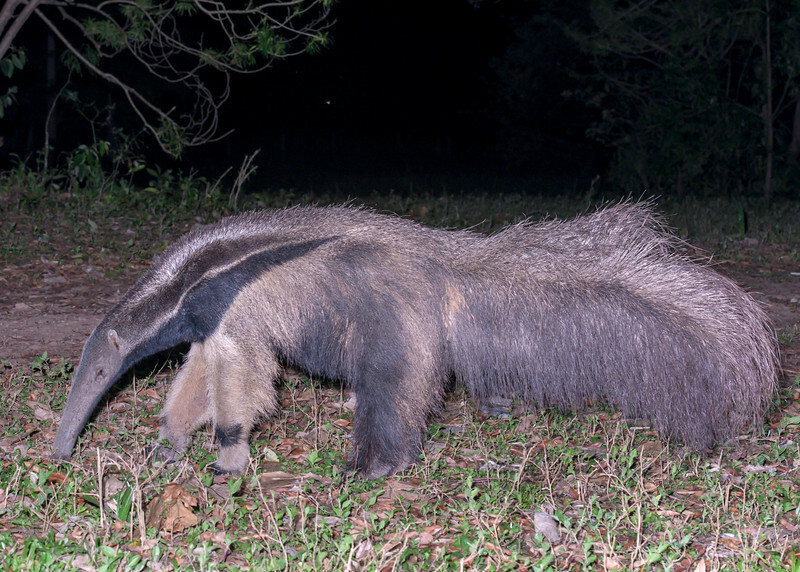 We had seen a Giant Anteater as a speck in the distance when we first drove down the Transpantanal Highway, but were surprised to find one in the middle of the compound when we returned from our tapir-watching. 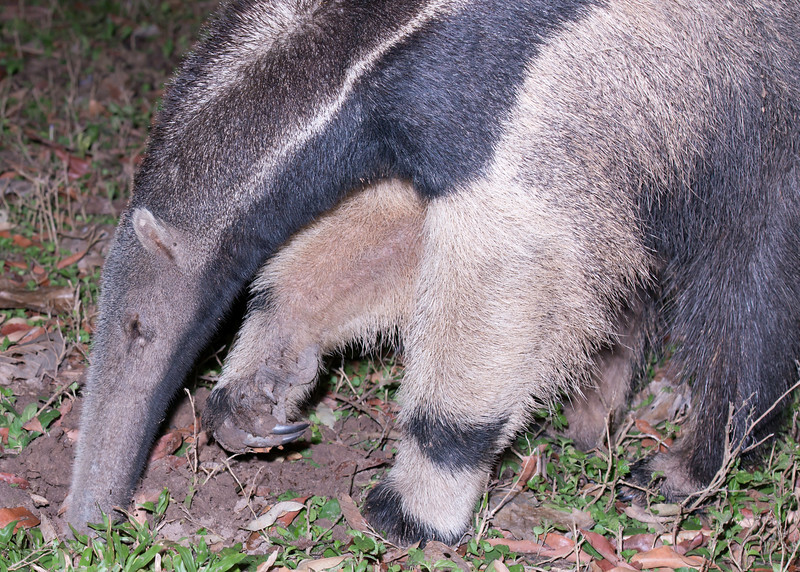 Not only did he not mind our presence as he foraged through anthills in the lawn, we had to back up to keep from getting run over. 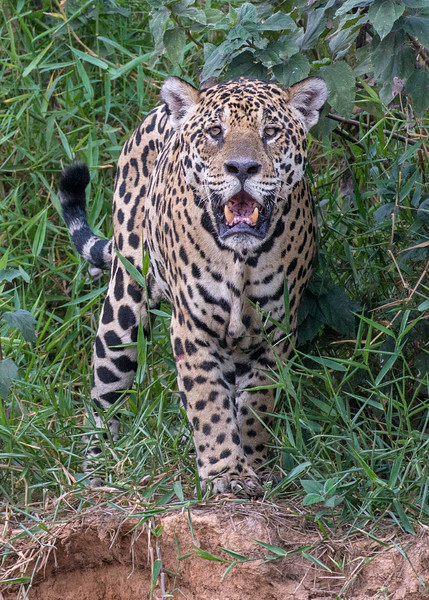 While not aggressive, they are quite capable of defending themselves and on rare occasions have been known to kill both jaguars and men with those formidable claws. Those specks on his nose are all ants. 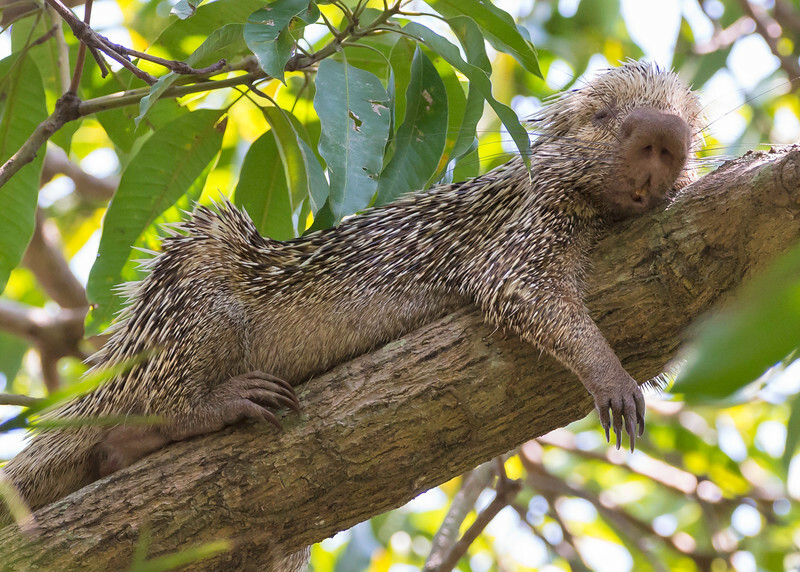 Tropical Porcupine with a prehensile tail taking a siesta in a tall tree. 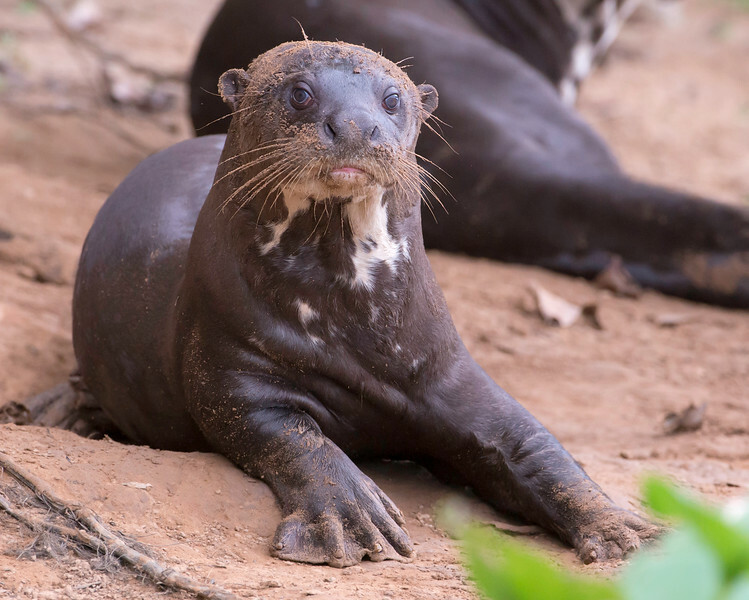 The second lodge was right on the Cuiaba River. 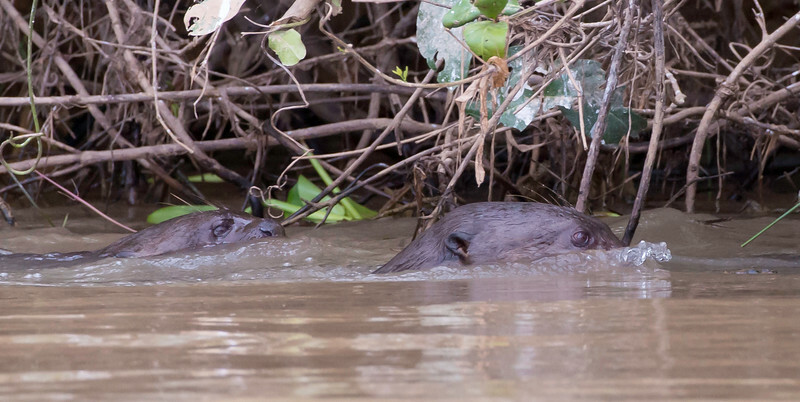 Our group piled into boats to cruise up and down the river looking for wildlife; it was very similar to road cruising for herps: beautiful scenery punctuated by intense adrenaline rushes. 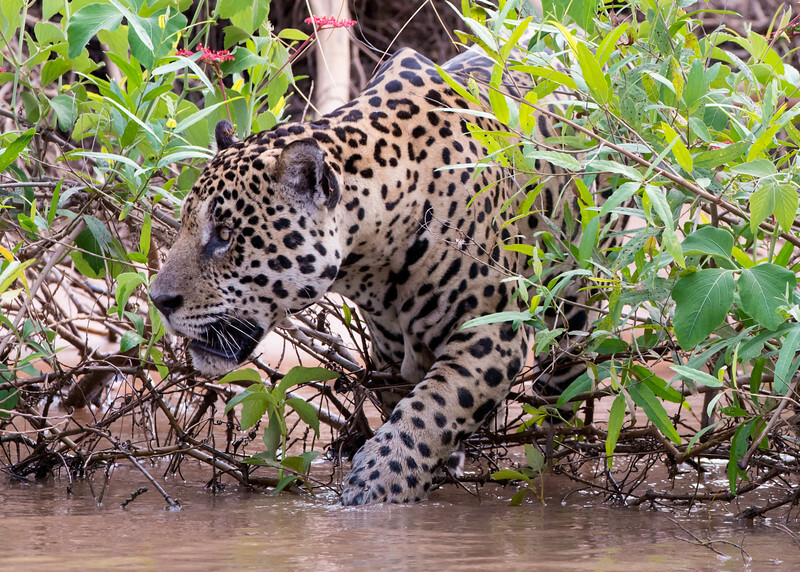 The jaguars in this area have learned that boats either hold fishermen who throw scraps on the bank, or tourists who leave them alone. Thus they are acclimated to the presence of boats and ignore them, going about their business. 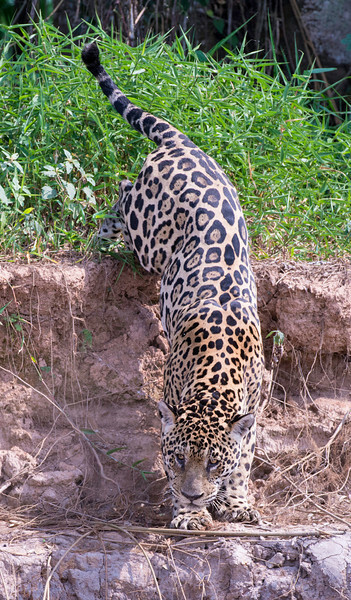 He walked along the shore for half an hour, disappearing and emerging from the thick brush. After a while he got more intense. 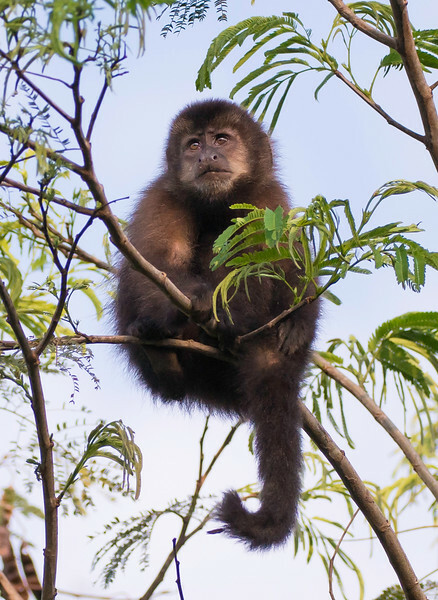 He had spotted some Capybaras and was trying to sneak up on them, but they saw him first and sounded the alarm. Foiled, he wandered off down the riverbank. We followed for another 30 minutes before he retreated into the bush. People ask, how close did we get? A respectable safe distance. 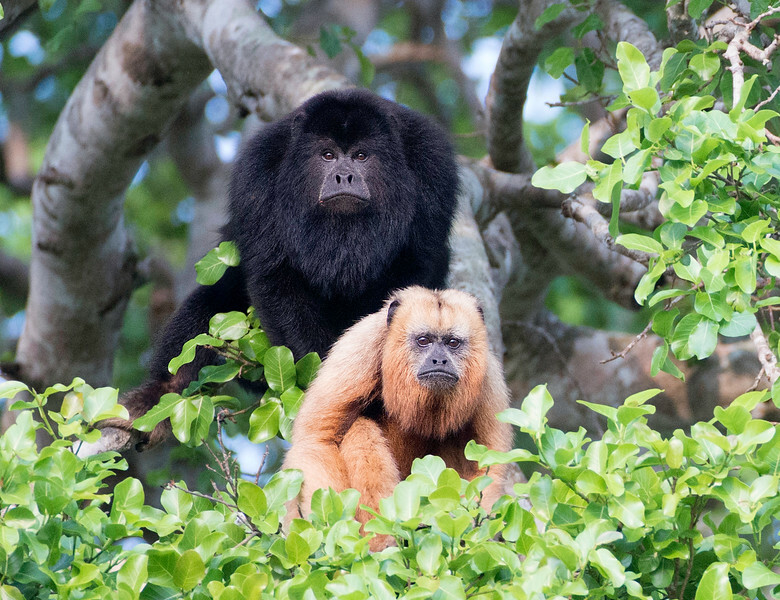 Black Howler Monkeys: the males are black and the females and young are light brown. 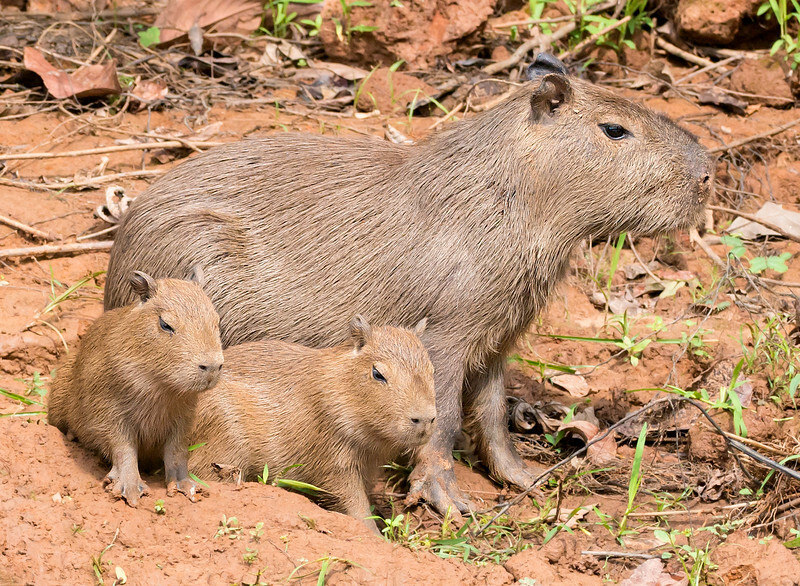 Baby Capys are so cute, you’ll want one as a pet. 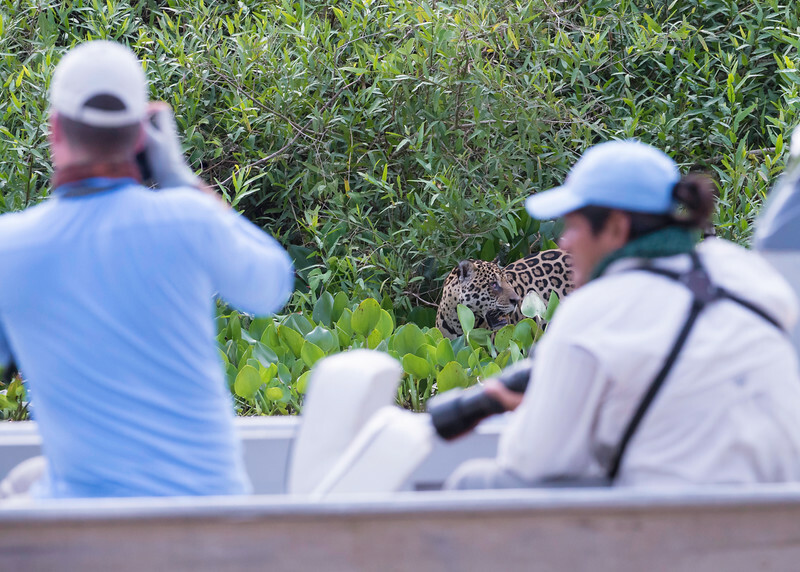 We spent three full days on the river and saw amazing numbers of birds and wildlife, including a total of five jaguar sightings. 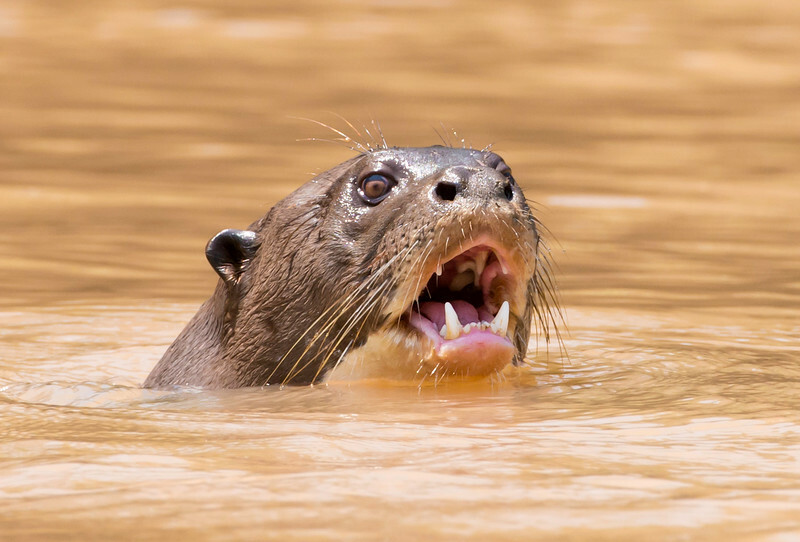 Giant River Otters get to be almost seven feet long. 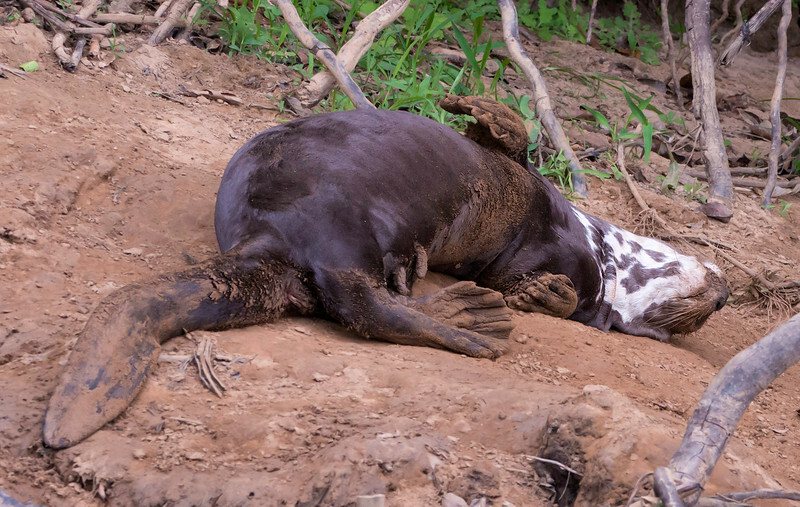 This family group climbed up on the riverbank and rolled around in the dirt. The white markings on their necks are different in every individual and probably help them identify each other from a distance. 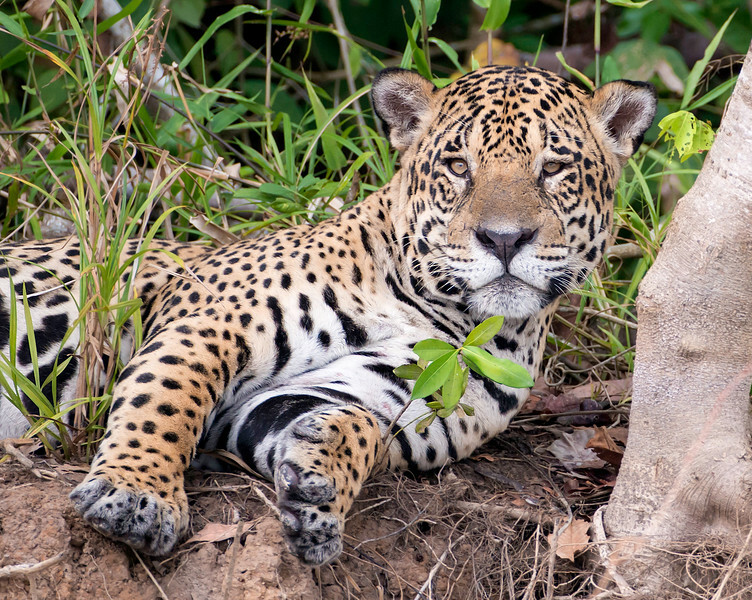 Most Jaguars are seen while sleeping during the heat of the day and are back in the brush with an obstructed view. 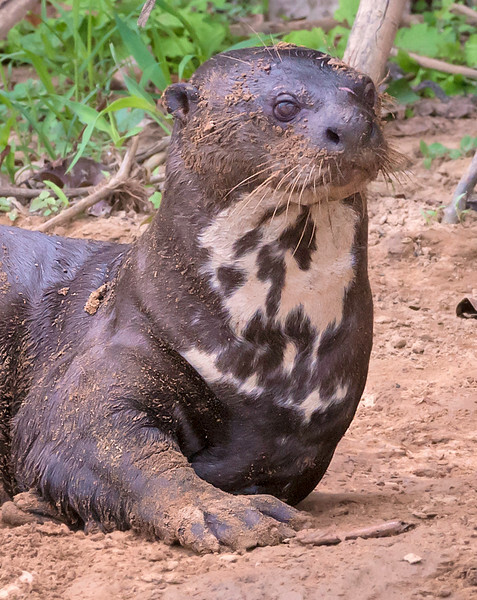 This Giant Otter had lost his family and was swimming back and forth, calling for them. 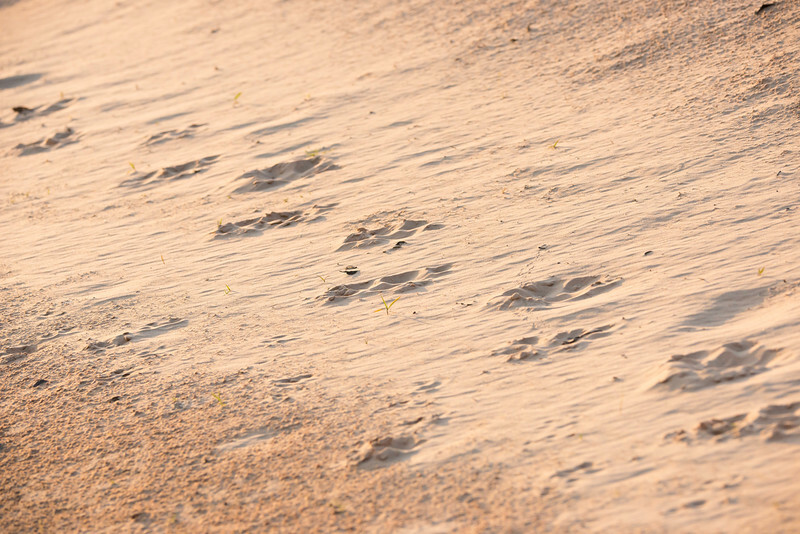 Jaguar tracks on a sandy beach. 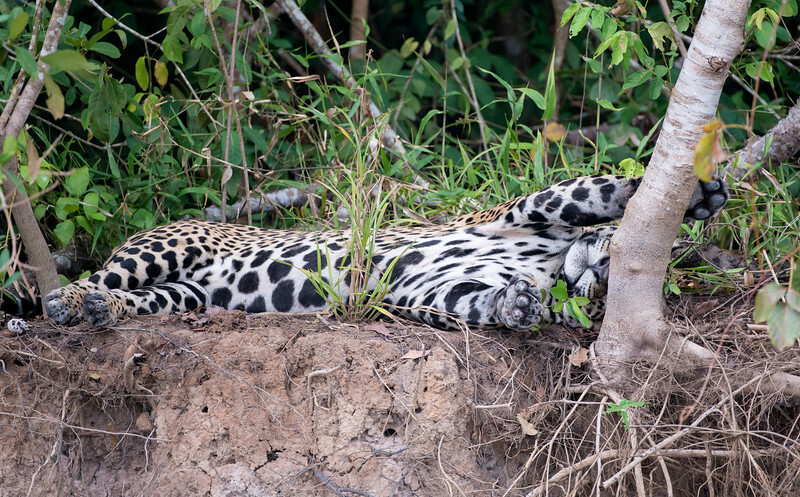 We found this Jaguar with a full belly napping on the riverbank. We also visited Igauzu Falls. 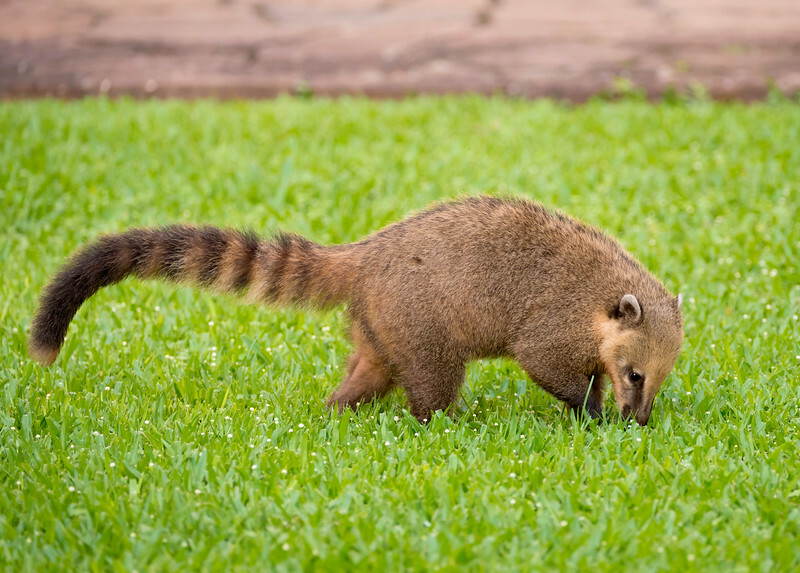 There were semi-tame Coatis running along all the paths around the falls. But don’t feed them! This four-foot-high sign makes the point clearly. 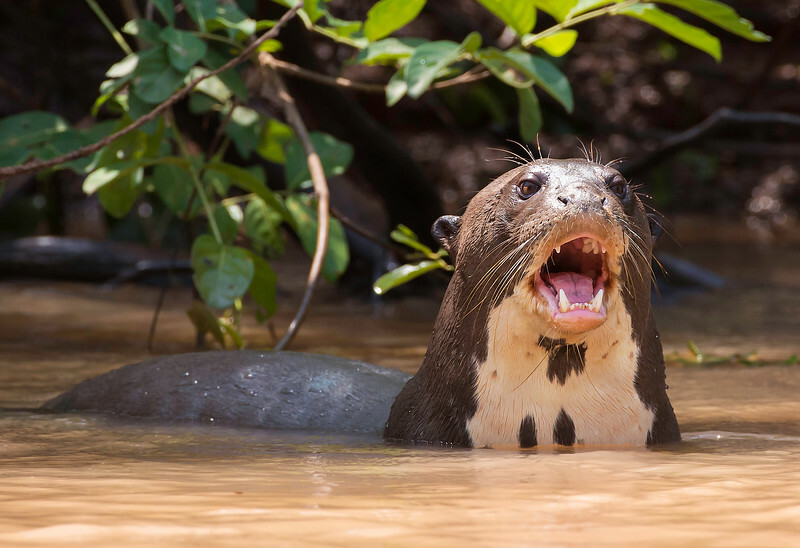 Look for my EOY14 Report in the main forum for the herps from this trip, plus a surprise! Great post. 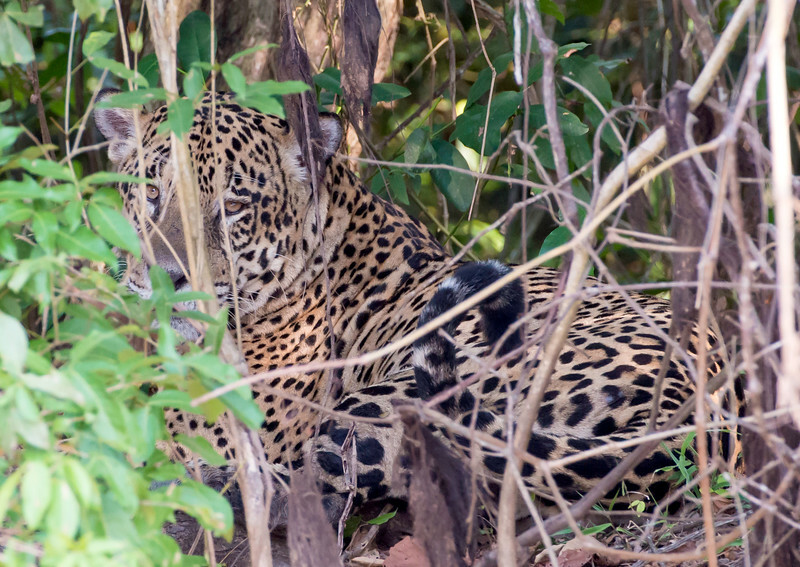 Love the variety and wow, great job in seeing the jaguars. Seems like a place I need to put on the list. 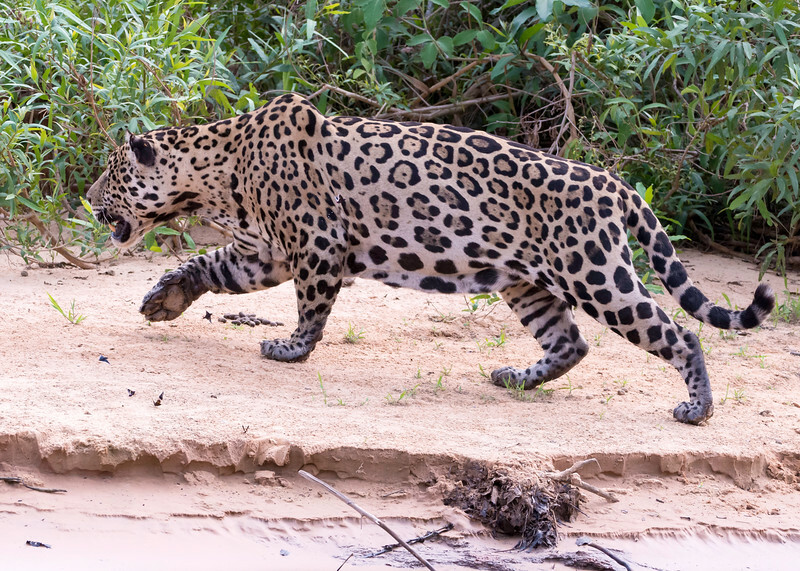 Amazing encounters w those jaguars! Looks like you really got to see a lot. Thanks for posting. A trip down there is definitely in my future. 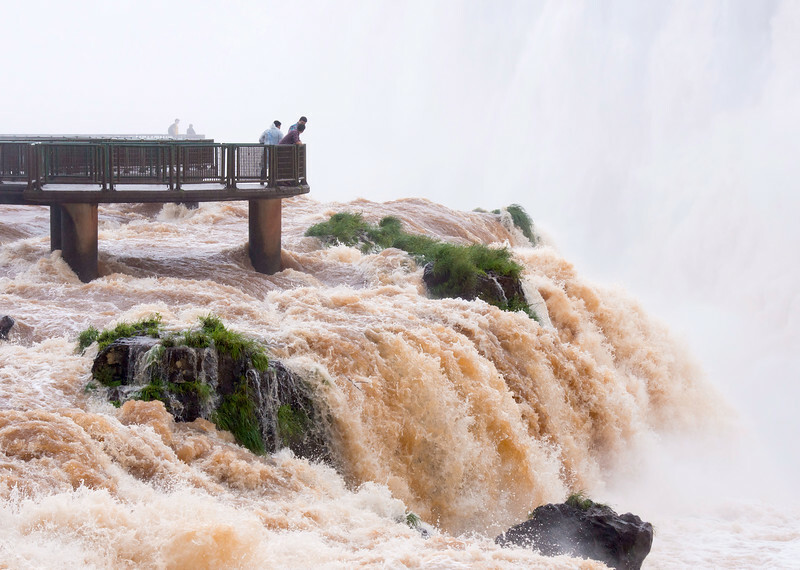 I've got a photo of that same sign from Iguazu from 2013 when I went down there. I saw a guy shooting a selfie with one as he was holding it close to his lap. I so wanted it to bite him right in the balls to teach him a lesson. Sadly, it did not. 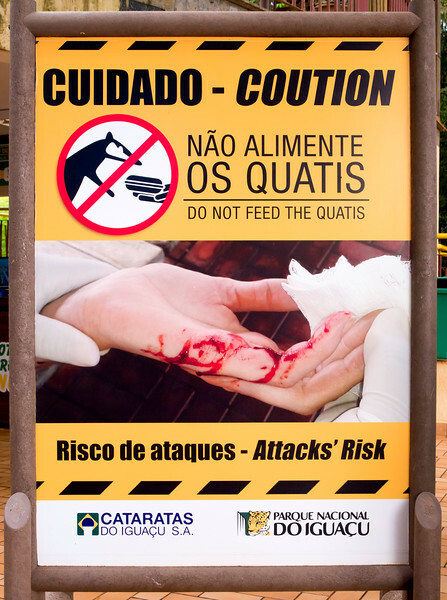 Rothdigga wrote: I've got a photo of that same sign from Iguazu from 2013 when I went down there. I saw a guy shooting a selfie with one as he was holding it close to his lap. I so wanted it to bite him right in the balls to teach him a lesson. Sadly, it did not. 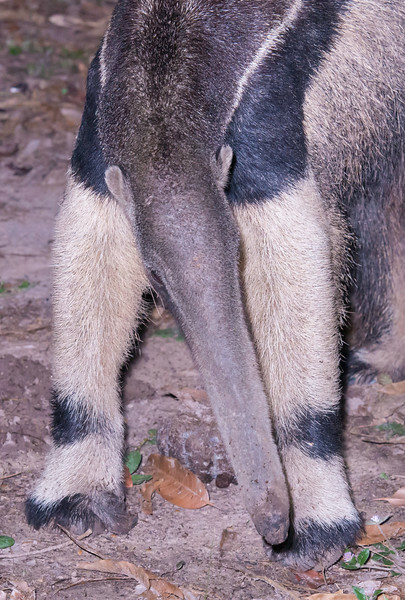 Yeah, when my wife and I were studying (white-nosed) coatis in Tikal National Park, Guatemala, we commonly saw tourists being way too familiar with them, too. 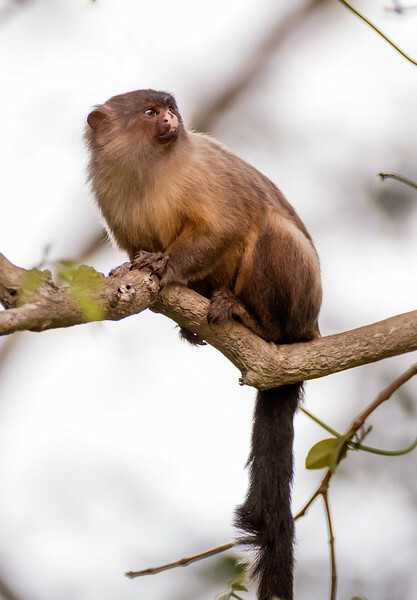 One day we came across a fellow who had been bitten clean through his hand, as he had been playing a game of teasing a big male with a bit of sandwich by offering it, then pulling it away, then offering it... The coati apparently put up with such treatment for only a moment before pointedly biting the guy and then enjoying the sandwich when the guy dropped it. 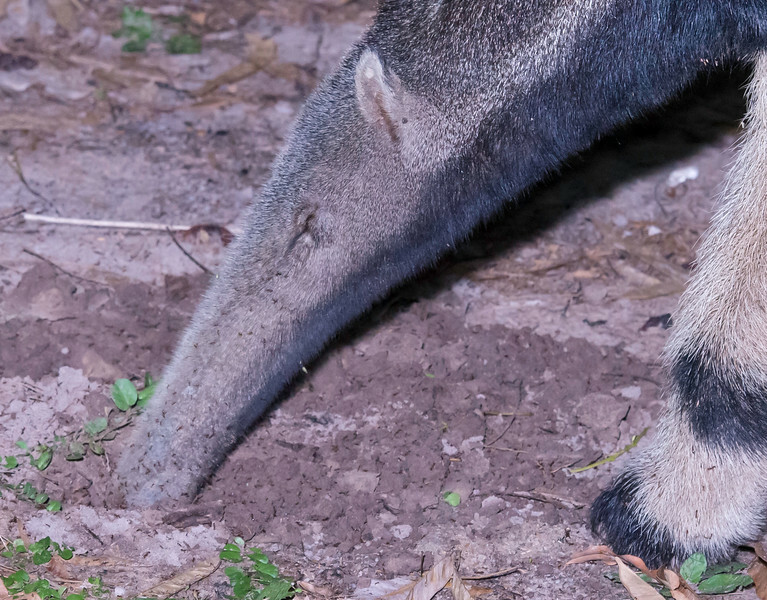 (Male coatis have impressively large lower canines, and they know how to use them. Nothing to fool with!) To the guy's (modest) credit, as he finished showing us his hand and telling us what had happened to it he said "I deserved it!" "You certainly did!" we replied, "Now go get some medical attention for it!" 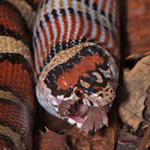 Lots of great shots, Steve, and some of some pretty amazing animals and interesting behaviors! 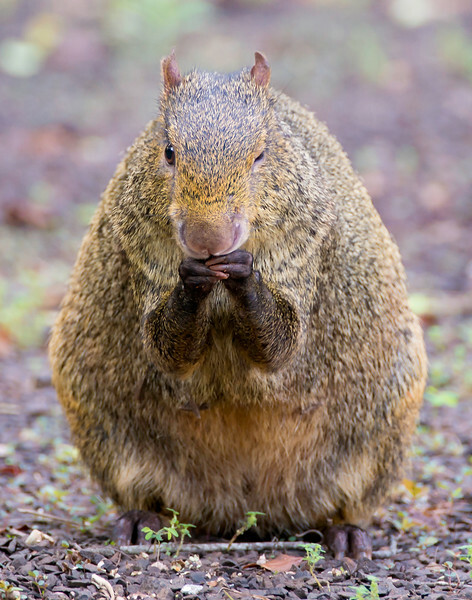 I have to admit, though, that the agouti shot is my favorite. Thanks a lot for sharing!